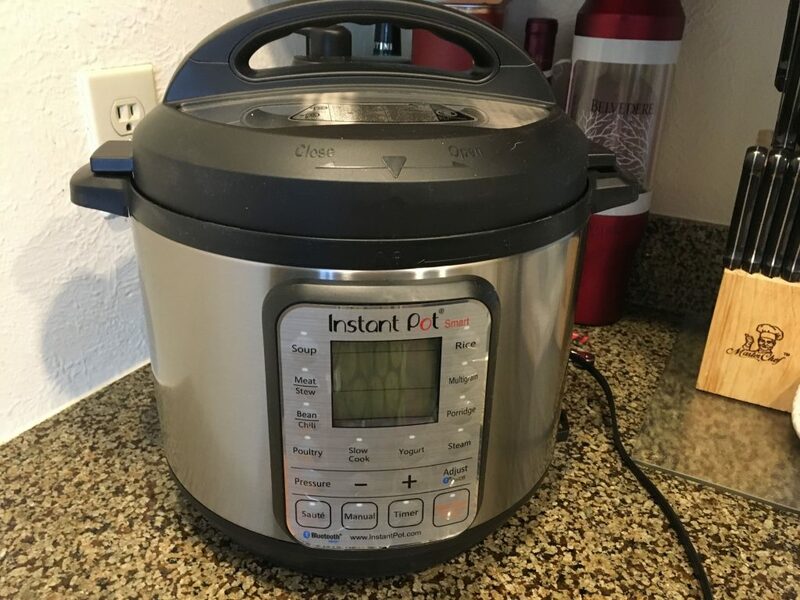 A Condo Vacation’s Best Friend: The Instant Pot! I got an Instant Pot for Christmas from Dave and my boys! ** Whoo! Believe it or not, through all my cooking adventures, I never delved too much into pressure cooking. 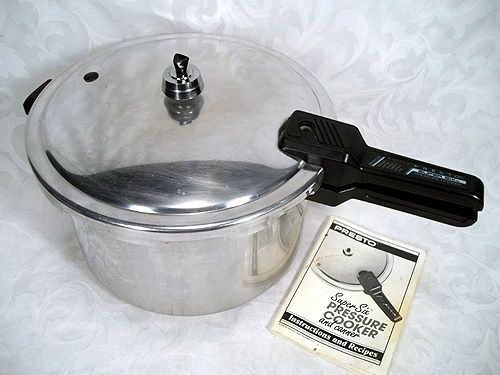 I remember my parents’ pressure cooker, it was the kind with the little weight that sat on top: when the pressure was just right, the little weight would rock back and forth singing an undulating whistle of steam. I don’t remember the specific recipes they’d cook, I think it was vegetable soup and maybe chili. It was years before I’d really delve into how a pressure cooker works and why it could be one of the most useful things in a busy family’s kitchen. So if you keep “V” (volume), “n” (number of moles of a gas), and “R” (a gas constant that never changes) the same values, any increase in “T” will result in an increase in “P”. So a pressure cooker seals the interior such that “V” and “n” won’t change (and “R” doesn’t change either)…so heating the cooker will raise the pressure. 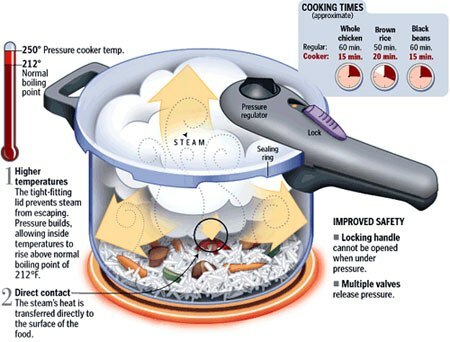 Raising the pressure allows the boiling point to raise up, and ultimately, this will shorten the cooking time. The Instant Pot is a digitized version of the classic pressure cooker. It’s currently the #1 best seller on Amazon for kitchen items. It looks more like a rice cooker, but it is programmable to make not just rice and slow-cooker meals, but also pressure cooked meals with the touch of a button. No more fine-tuning the gas or electric stovetop setting to get that “sweet spot” of pressure…just hit the button and go! We opened our Christmas gifts just before heading out into the mountains last week. Almost as an afterthought, I put the Instant Pot in the truck with the other foodstuff we were taking to the condo. One of the things one has to deal with regarding pressure cooking is the elevation adjustment. I was about 700′ higher than when I had tried this at home (6800′) and I’d have been happy with one more minute of cooking at 7500′. This is one of the best things about the Instant Pot! 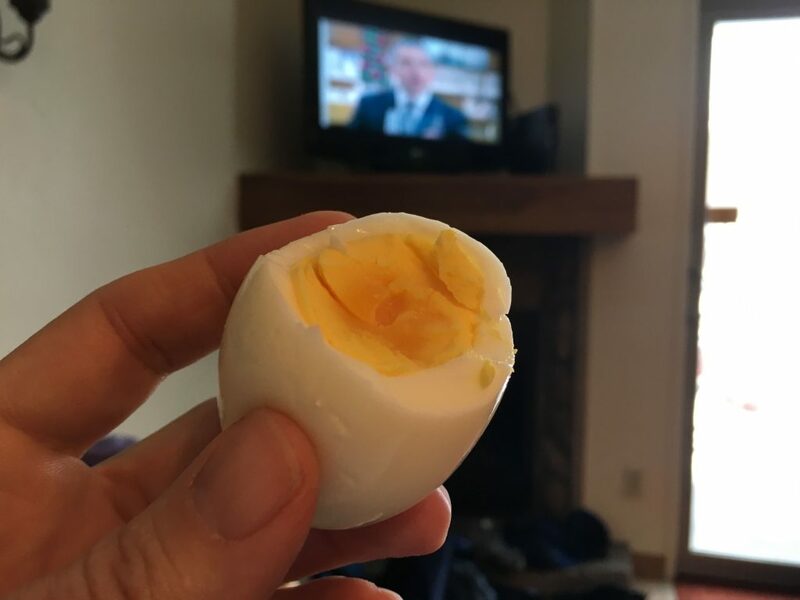 Set-it-and-forget-it hard boiled eggs! In about 10 minutes! 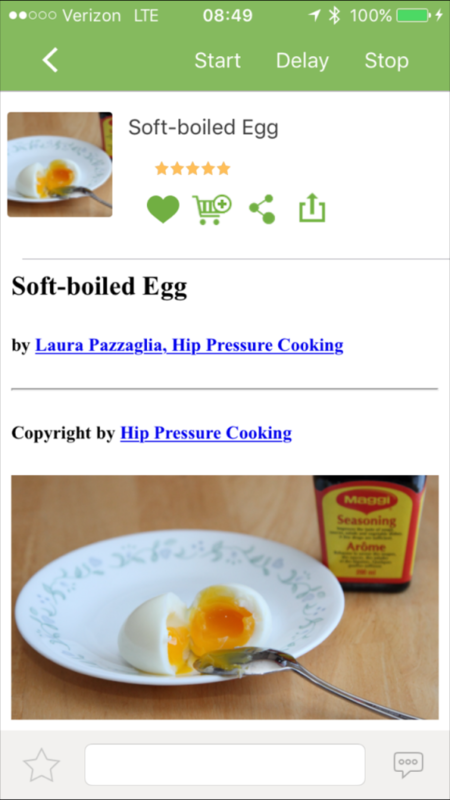 I’m not going through all the steps to do this, but I will point you to this blog post about it, and also mention that there is a soft boiled eggs “program” on my smartphone app…so I add a minute or two to that program before hitting “start”. You can just hit “start” in the upper right to get it going. With my version of the Instant Pot, I can program in an automatic elevation adjustments via my phone’s GPS. I still added one minute to the programming here so I had a hard boiled eggs instead of soft boiled. I’m the only one in my family who likes hard-cooked eggs. So with the Instant Pot I can just make two of them for me as a breakfast. It’s a campy name for a weeknight meal that kids will love. I first had heard of it in my Rival Crock-Pot cookbook, and over the years I’ve made a couple modifications so it can be a more complete dinner. But I had to assemble this recipe before heading out the door in the morning. With the Instant Pot, I don’t have to do that anymore. Once we got to the condo location, I picked up a package of chicken tenderloins, one can of cream of chicken soup, and one can of cream of mushroom soup at the local grocery store. I had brought baby carrots and a box of chicken stock from home. For the Instant Pot variation, I had to do some improvisation. I used this recipe from the Instant Pot website, but didn’t include the biscuits so I skipped the second cooking. Also, I added too much chicken stock so the “gravy” wasn’t as thick as we like. The whole dish was done in about 30 minutes. Just before making the chicken I had made a few cups of white jasmine rice with the Instant Pot and served the chicken and sauce on the rice. I think I will be trying the full “chicken and dumplings” soon. I have a can of refrigerator biscuits on hand that I can use. I bought a box of angel hair pasta and a large Costco-sized (64 oz.) jar of Prego red sauce from home. And then bought a pound of lean ground beef and a small container of grated parmesan at the grocery store near the condo. I set out two pieces of bread for 24 hours and ground them into bread crumbs. I had plenty of eggs on hand. The recipes I found online involved including the pasta with the meatballs and sauce, but I was hesitant to do this because those recipes call for regular spaghetti and our family prefers “angel hair.” So I used the recipe linked above but omitted the steps involving the pasta. Instead I used the electric skillet to boil the angel hair separately. It turned out perfectly well. All in all, I found that having the Instant Pot made for some inexpensive cooking options in our condo unit when otherwise our family might have gone out to eat. And with that volumes of food our sons eat now, that was hard to do for less than $50 in the little resort town where we were staying.